If there’s any comparison to be made between Charles Dickens’ 1854 novel and Stephen Jeffreys’ 1982 stage adaptation, it’s that one is a hard attack on the utilitarian mind-set driving the Industrial Revolution and the other is a hard slog, right up to its mind-numbing conclusion when remaining plot threads are tied down. Ever since it was created for Pocket Theatre Cumbria, Jeffreys’ version has become the Hard Times adaptation of choice – popular yet challenging because it requires multitasking actors to constantly step out of role and move the story along as third person narrators. For Chris Lawson’s production, Sammy Dowson has designed a grey factory-like structure versatile enough to represent the entire “ugly citadel” of Coketown. Wistful background music contrasts with social harshness. Lighting is gorgeously moody. But the action kicks off in unrealistic melodrama mode, with too much over-blown bluster from William Travis’ Josiah Bounderby, and Cliff Burnett verging on ‘dastardly villain’ acting as Mr Gradgrind, preacher of heartless facts. So, no question who the baddies are. Still, once the “good” relationship between Verity Henry’s Louisa Bounderby and Felicity Houlbrooke’s Sissy Jupe develops, Dickensian caricatures are mostly kept at bay: the inevitable martyrdom of mill operative Stephen Blackpool (Tom Michael Blyth) is unsentimental and understated, although the unmasking of Bounderby’s maternal origins and Mrs Sparsitt’s nosiness are reduced to cheap laughs. A programme note claims that, socially, there are parallels with Britain today. 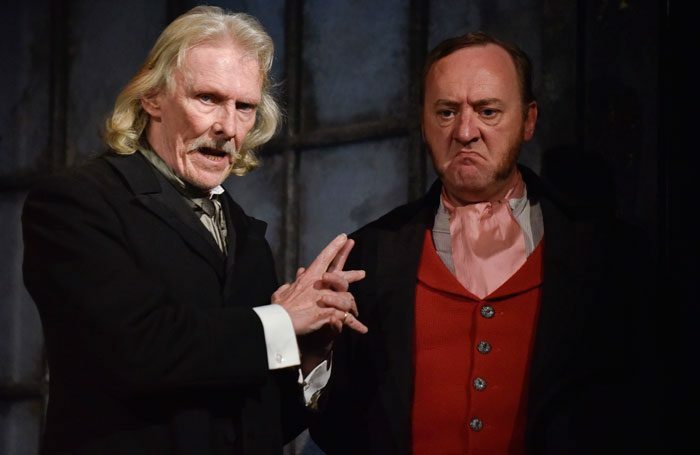 Yet on stage, Dickens’ concerns about the soul-stunting effect of an unjust Victorian system feel curiously disconnected from our own times.